Creating a defensible space around your home is easy as 1-2-3. On Saturday, July 15, 2017, a fire was reported 1 mile North of Carlton near Mile Post (MP) 23.75 on the East side of roadway. 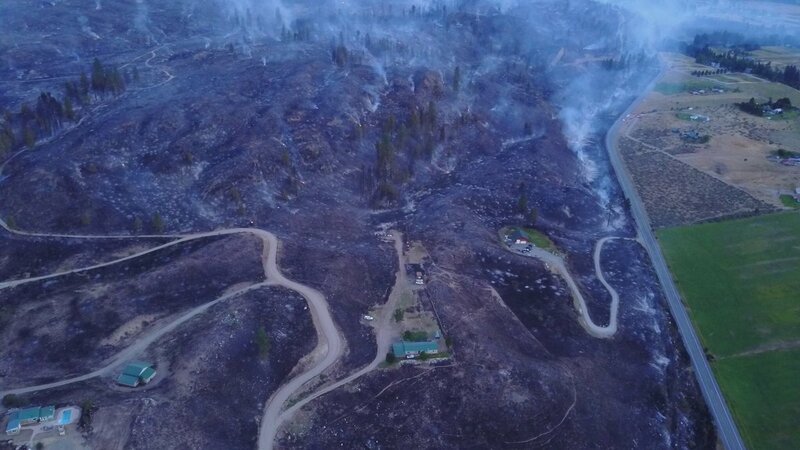 The fire then would cross over SR 153 and the Methow River near Ross Road with it burning North to just past Taylor Road near MP 26 and to the East. Washington DNR – NE Region. 107 personnel. 3 crews. 17 engines. 3 helicopters. State mobilization units of 4 strike teams and an a Type 3 IMT unit. Active fire behavior with spotting. 1000 acres. 0% containment. Level 3 evacuations from Carlton to Benson Creek and Carlton up Texas Creek. Level 2 evacuations from Benson Creek to Lower Beaver Creek. Fire personnel will re-evaluate on 7-16-2017. 2 Red Cross Shelters are in operation: Twisp Community Center and Brewster High School. PUD turned off electric power from Twisp to Libby Creek due to burning power poles and downed lines. Power was isolated and restored to most users. The burnt poles are planned to be replaced in daylight hours 7-16-2017. The current weather report is a forecast of cooler temps on Monday, July 17, 2017, with winds out of the North and NW 6 to 11 mph.